When dealing with abrasion hazards, it's important that you can get the protection you need. The MCR Safety GP1002NS General Purpose Nitrile Sandy Palm Coated Safety Gloves feature a sandy nitrile coating, providing additional protection against abrasion. Their lightweight design and great fit makes them incredibly comfortable and easy to wear. 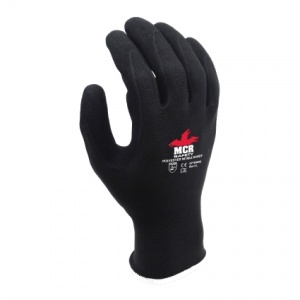 To keep your hands comfortable as you work, the MCR Safety GP1002NS gloves have been developed to provide an incredible fit, helping you to work more easily. On top of this, the gloves also feature a lightweight design thanks to their polyester material, helping your hands to move more freely. The sandy nitrile finger and palm coating on the MCR Safety GP1002NS gloves gives them additional resistance to abrasion. This gives you additional protection and also lends the gloves an extra level of longevity and durability.